Sydney attraction-guides.com - Sydney, Australia attractions guide Sydney Parliament House attraction information, opening hours, location and address of Sydney Parliament House, Mint Building, history and construction, architecture, collections, public gallery, Rum Hospital, Legislative Council, Martin Place train station, Macquarie Street, tel / telephone number, and general tourist information about Parliament House in Sydney Area, New South Wales NSW, Australia, AU - Last updated 30/10/2012. Sydney's spectacular Parliament House is almost identical to the closeby Mint Building and was completed in 1816. Featuring elegant architecture, a sandstone façade, two storeys, verandas and a number of important collections, the public gallery in Parliament House is only open on days when Parliament is in session. Originally constructed as the northern wing of the Rum Hospital, Parliament House has been used by the Legislative Council since 1829, making it the oldest continually operated parliament building in the world. 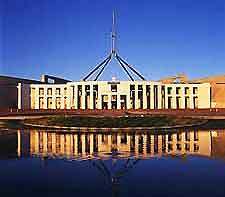 Parliament House is located near to Sydney's Martin Place train station, in the Central Business District (CBD) of Sydney.